If there’s one thing we know about search engine optimization, it’s that Google’s algorithms frequently adjust. This is partly due to marketing and human interaction, and partly due to rapid advances in technology. We’ve come to realize that keeping that top spot on Google’s search page is just as hard and reaching it, so we’ve put together some tactics that will keep you competitive in 2017. By now, everyone should be familiar with mobile optimization. App integration takes it a step further. When you develop an app, you open opportunity for more audiences while narrowing your information output. Anyone looking for your information regarding your brand will find it easily accessible in your app. Because difficult to read sites will lead to a high bounce rate and take a knock on your SEO, mobile optimization and app integration will reduce difficulty in visibility and increase the chances your viewers will stay. Voice search is used at nearly a 20% rate in android and iPhone users. Mobile searches are rapidly increasing in the business world. Voice search opens a new window of searches and keywords specific to you, which will create more customized searches for you to target. This includes some creativeness. You can use long tail keywords to appear as the answer to the searcher’s questions, and you can claim keywords that may come up as voice searches as mistakes in the devices. For example, if a searcher asks Siri, ‘Where can I buy some “Tic Tacs”,’ Siri may interpret the popular candy as “tick tacks” and so including “tick” and “tack” as keywords may be beneficial. Long tail keywords are great in that they privatize your searches, narrowing the chances your keyword will compete with another. Voice search is a large component of this, as searchers tend to ask a full question to their devices when researching a product or service. This does also apply to traditional desktop searches, as Google has seen a rise in longer queries in the search bar. What’s the difference between “http” and adding that little “s?” A whole lot of benefits for your site. Most notable for online marketers, your site will get a boost in rankings on Google. A few other things that little “s” stands provides? Encryption, data integrity and authentication to encrypt data, block it from modification and to provide authenticity of the website for you users. Searchers want easy answers and they want them fast. A long load time will lead to a higher bounce rate. So will a user’s inability to find the content they are looking for easily. The easiest fix we can come up with for this, is to take a hard look at the content of your website. If there is too much information, cut the unnecessary out. Include an FAQ page that directly answers your searchers queries. The quick repair will make your actual site load time faster, and the information finding process faster. You don’t have to overhaul your entire marketing strategy to stay relevant in 2017. 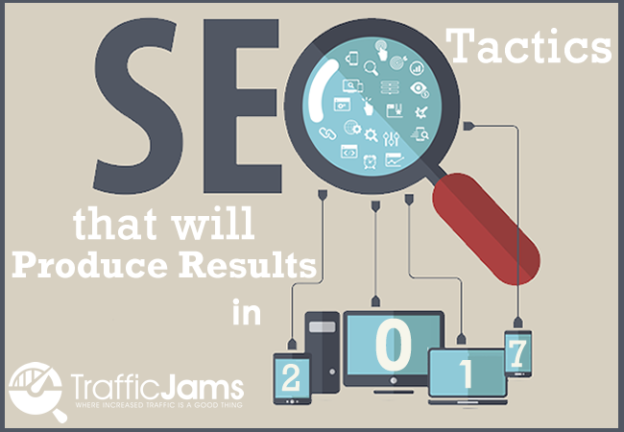 Contact Traffic Jams to learn how you can increase your spot in the rankings. Call us at (855) 599-9998 or fill out our contact form today.